Caminetto's history started in 1959 when Guiseppe Ascorti, from Cucciago, and known to his friends as "Peppino", was hired by Carlo Scotti to work at Castello, located in nearby Cantu. 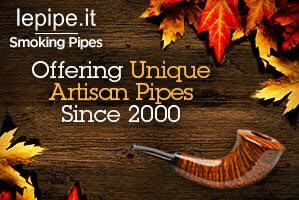 Since it's foundation in 1947 Castello had contributed substantially to regained glory for Italian pipemaking. 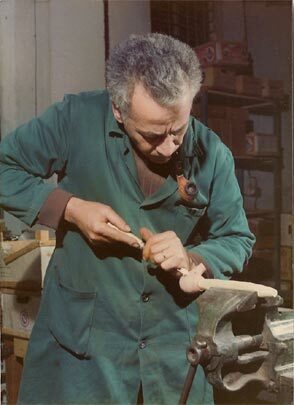 Talent and assiduity soon made Ascorti one of Scotti's most notable pipemakers - a man he counted on for the future. But, Ascorti had his own far reaching plan: He wanted to work as a self-employed pipemaker! After his wife, Paola, had taken over her parent's small greengrocery in the early 1960's this plan became more concrete. The additional income from the shop enabled him to buy tools and machines little by little to furnish his own workshop. By the end of 1968 he was ready and left Castello. 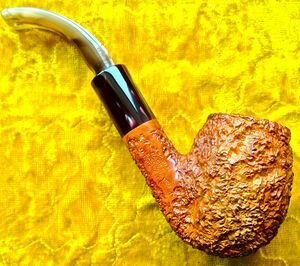 Ascorti also persuaded his co-worker, the young and highly-talented pipemaker Luigi Radice (born 1939), to join him - the two were neighbors in Cucciago. Carlo Scotti, whom is known as a perfect gentleman, is reported to have spoken unreservedly about this development. Ascorti & Radice started to manufacture pipes on their own. 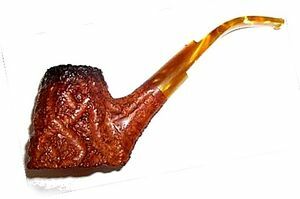 One of the first who agreed to market their pipes was Gianni Davoli, proprietor of a tobacco shop in Milan. The situation was perfect--two pipemakers in search of a distributor, and a pipe merchant in search of a mainstay brand to market. Davoli - via friends and relations in the States - had made flourishing contacts with US pipe wholesalers and traders. He shipped some pipes across the pond for inspection and received excellent feedback for the very high quality of the pipes. He, shortly after, offered to be the sole distributor worldwide, and Ascorti & Radice happily accepted. Now, Davoli concentrated on marketing the Caminetto brand in the United States. His strategy was as simple as it was brilliant. There was a remarkable Castello hype at the time. 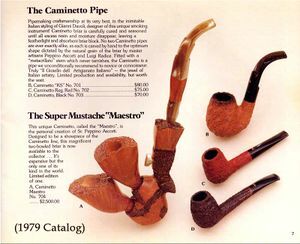 Castello pipes were highly sought after but hard to get due to limited production. Davoli filled the gap, promoting the Caminetto to be absolutely equal to the Castello in terms of quality, while asking only half the price. And best of all: the Caminetto pipes were consignable! The Tinder Box International would be under contract with successful nationwide distribution. The brand's success was overwhelming - far beyond any expectation, with the rusticated Business line becoming the most popular. Ironically enough, the increasing demand soon drove Ascorti and Radice to the limits of their production abilities. The brand had been introduced successfully in Germany, and in Italy to some extent. By the end of 1970 more hands were needed. Even Ascorti's elder son, Roberto Ascorti (born 1958; and the current owner) helped with stamping and shipping the pipes when he was just a schoolboy. The most important employee is Cesare Vigano, who has worked for Caminetto / Ascorti for more than thirty years. To bring about more stability and higher production, Davoli invested a considerable amount of money in modern pipemaking machinery, and in doing so went from distributor to co-owner of Caminetto. By 1973 he held the vast majority of the company's capital. The boom continued strongly - especially in the US. Production increased steadily, from 3,000 to 5,000 and then 7,000 pipes being made per year, placing Caminetto at the top of US sales in their market segment. 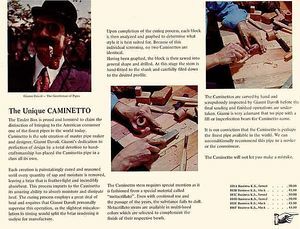 The 1974 Tinderbox catalog celebrated Gianni Davoli as "master pipe maker and designer" and "sole creator of Caminetto" without a single mention of Ascorti or Radice! In addition to Caminitto, Davoli sold a private label brand by Ascorti / Radice named Gianni for a couple of years in Italy. Caminetto prospered throughout the 1970's. Everyone was hard at work, and sales continued to increase, but soon disagreements occurred among the three principles, marking the beginning of the end. First, Luigi Radice became increasingly discontent with the factory-like production. Pipes were made by standard shape numbers, and there was no longer room for his own creative pipemaking and personal development. He was also afraid that the increased production would eventually lead to a reduction in quality. Radice started quarreling with Ascorti about the future course of Caminetto, and they were unable to find a solution. 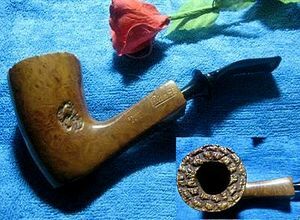 Radice, being an employed pipemaker, rather than a partner, could not assert himself. Ascorti shared Radice's concerns about maintaining quality in the face of the higher production, but Davoli had gained almost total control by this time, and insisted on the higher production numbers. The next controversy was regarding Roberto Ascorti. The young man had visited a school of arts and also completed his service in the army. Roberto did not want to attend a university, and instead started helping in the workshop with pipe repairs and making his first few pipes. His father wanted to hire him on as a full-time pipemaker, but Davoli refused, being afraid to lose influence to the potentially strong alliance between father and son. The situation worsened in 1979. The foreseen quality issues occurred--there were complaints from the US. And, there is some indication that Carlo Scotti considered legal actions, asserting that Caminetto had copied some of Castello's successful shapes too exactly. At this point Ascorti wanted to sever ties with Davoli, but Davoli was able to assert himself and maintained control. 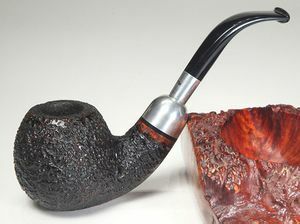 'I tre Camini' disbanded in December of 1979, when Luigi Radice left, without prospects, knowing not where or how he would continue as a pipemaker. A clear indication that he had very strong feelings as to his future with Caminetto. Ascorti vs. Davoli continued for a few more months. The Ascorti family offered to buy the brand, but they couldn't afford it at the time. So, Guiseppe Ascorti hastily equipped a new workshop, and then he left company which was essentially his own. But the complete crew whom he had trained in the old Caminetto workshop followed him. And thus they were able to re-start making pipes within a few weeks in 1980. For three months they sold pipes under the name Sergio. Only 800 to 1,000 Sergio pipes were released. Then Giuseppe Ascorti and his son Roberto founded a new company under their own last name. - For the further history see Ascorti! 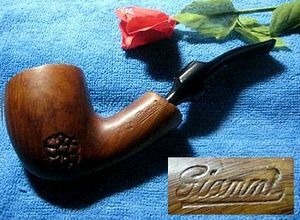 Upon leaving Caminetto, Luigi Radice went through huge difficulties, but through the 1980s he also managed to establish himself as independent pipemaker. Gianni Davoli, last chimney standing, stayed behind, now owning a pipe workshop without any pipemakers. Strangely enough, the old Caminetto workshop caught fire shortly afterward and burned down to ashes. For further reading see this excellent post by user joshoowah and subsequent discussion on: Brothersofbriar.com. We are also adapting this post for Pipedia here: The History of Caminetto (shapes, stamping, articles, etc.). This page was last edited on 27 December 2018, at 11:11.